I’ve said it before, but I’ll say it again. 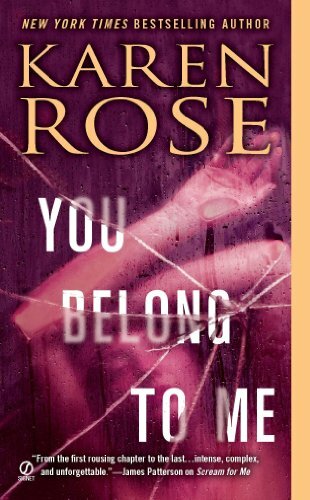 Karen Rose is literally as good as it gets at writing romantic mystery/thrillers. No one can do what she can. She puts you straight into the lives of the MCs and victims, making them feel like characters you’ve been reading about for years. At the same time, she puts you in the mind of the killers with chilling success. As you continue to bounce back and forth between different POVs you’ll become so addicted to her books that you won’t be able to stop until you’ve read them all. You Belong To Me is no exception. I think this is the first book she has written that isn’t connected to all her previous works, but I didn’t miss having familiar names and places. I am intrigued by some of the other characters introduced, so I’m glad she is setting up a new series of connected books. Lucy Trask, the female MC, actually had me constantly back and forth as to whether I liked her personality. But, eventually, enough of her history was revealed that it became easy to forgive her for all of her personality issues. Even if I hadn’t ended up liking her, it is really refreshing to have an author unafraid to present her characters warts and all versus making them all unbelievably perfect. Although, J.D. Fitzpatrick was pretty darn wonderful. The tough-yet-sensitive-cop character type that will never get old. Almost immediately as they meet, their chemistry is thick enough to feel through the pages. I am by no means a fan of insti-love, but in this case the high stress situation they’re put in works in their favor and makes their progress into a relationship completely believable. I love how we get bits and pieces of the story, some that seem completely unrelated, at a time so that it takes awhile before the bigger picture becomes clear. Then, once we know the who and why – she throws in a curve that will take you by the throat until the very end. The story that starts with Lucy’s older brother in high school, continues through his seemingly accidental death and through to the current day and the twelve victims a killer bent on revenge leaves behind will leave you second guessing everything and everyone you come across while reading. If you’re a fan of the romantic suspense genre, you definitely can’t pass this one by! You Belong To Me by Karen Rose Book Trailer from cosproductions on Vimeo.